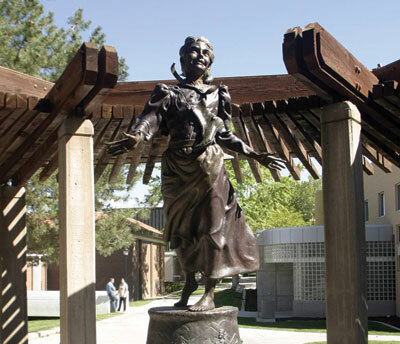 August 3, 1991, was designated by the Utah State Legislature as “a day of praise for Ellen Pucell Unthank.” On that day around 1,000 people, including a host of dignitaries, attended the dedication of an impressive life-size monument on the campus of Southern Utah University in Cedar City. Among the dignitaries were President Gordon B. Hinckley, first counselor in the First Presidency of the Church, Utah Governor Norman H. Bangerter, and Baroness Caroline Anne Cox, a member of the House of Lords in the Parliament of the United Kingdom. The ceremony began when the university bagpipe band led the group from the Randall L. Jones Memorial Theater to the site of the monument where the sculptor, Jerry Anderson, unveiled it. President Hinckley addressed the group then offered the dedicatory prayer, Baroness Cox gave the principal address, other speeches were given, and the Southern Utah Choir performed special musical numbers. The handsome new monument portrayed a smiling nine-year-old girl, plainly dressed, barefoot, arms outstretched, and hair flowing in a breeze, just before she and her family began the long handcart trek toward Zion. Her name was Ellen Pucell; her nickname: Nellie. Obviously excited about the future, she was one of 576 members of the ill-fated Martin handcart company, only 431 of whom would finally make it to their destination. The statue of Nellie Pucell in Cedar City, Utah, by sculptor Jerry Anderson. At the time in her life represented by the monument, little Nellie could hardly have imagined the tragedy she was about to experience and the horrible permanent effect it would have on the rest of her life. But the “day of praise” celebrated not the tragedy but, rather, the faith and perseverance Nellie demonstrated in later life, her triumph over adversity, her exemplary living, and the positive influence she had on those around her, despite her continuing poverty. Nellie’s story began in England, where her parents joined the Church shortly after the first missionaries arrived in 1837. Her mother, Margaret Perren Pucell, was among the first to be baptized and was the second woman to be confirmed a member of the Church. However, Margaret kept her baptism a secret from her husband, Samuel, fearing he might have been influenced by the festering prejudice against the Church. Imagine their mutual surprise when, about three months later, Samuel told her the he had secretly joined the Church a month earlier and had prayed ever since that she, too, would accept it, and she revealed to him that she had been a member all along. The Pucells were faithful members and, like thousands of others in the British Isles, were eager to join the Saints in America. In 1856, they decided to emigrate, taking with them their two daughters, Maggie, age 14, and Nellie, age 9. However, because of their poverty, they did not have the funds to purchase the wagon and other supplies they needed to cross the continent to Utah. They signed up, therefore, with a company headed by Edward Martin, a returning missionary, and prepared to cross from Iowa City to Great Salt Lake City pulling a handcart. The Martin company was the last to leave England that year, sailing on the ship Horizon on May 25. The story of the handcart pioneers is well known (see note below for some references). During the five years the handcart venture lasted, 1856-1860, some 3,000 migrants in ten different companies made the trip. Most of them got along surprisingly well, except for the last two groups in 1856: the Willie and Martin companies. They arrived in Iowa late in the season and the Martin company did not start from Iowa City until July 27. They were caught in an early snowstorm on the high plains of Wyoming. In what has been called the worst disaster in the history of overland travel to the West, around 200 members of the two companies died of cold and starvation while dozens of others were maimed and/or disfigured. The Martin company was the last on the trail, and its people suffered the greatest loss. The Pucells were not to escape the tragedy. Somewhere along the trail Margaret became ill, too feeble to walk. Samuel laid her in the handcart and continued on but at one of the river crossings he stumbled and fell into the icy water. A few days later he died from a combination of exposure and starvation. In another five days Margaret also died. The two orphaned girls went on with their friends in the Martin company. Young Nellie turned ten on November 6, though it was anything but a happy birthday for her. Her feet, as well as those of her sister, were seriously frostbitten. Eventually the company was picked up by rescue parties sent by Brigham Young, but they did not arrive in Salt Lake City until November 30. Then came the next tragic blow. It was only after the girls arrived in Salt Lake City that they were able to remove their shoes and socks from their frozen feet. The flesh on their feet was frozen so badly that it came off with their socks. Nellie’s feet were particularly bad — so bad, in fact, that a doctor said she would not live unless they were amputated, along with part of her legs. But there was no adequate medical equipment for such an operation and no anesthetic to ease the excruciating pain. Little Nellie was strapped to a board to hold her down while the crudest of tools, a butcher knife and a carpenter’s saw, was used to amputate her lower legs, not far below the knees. As if that were not bad enough, the surgical procedure was so primitive that the wounds healed badly and bone continued to protrude from the end of her stumps. The pain never ceased as Nellie continued the next 59 years of her life shuffling along and doing her work on her knees. In later life, a doctor volunteered to cut off the protruding bones and cover the wounds more adequately with skin, but the memory of that excruciating 1856 operation was so vivid that Nellie refused to submit to another. Now begins the truly remarkable part of Nellie’s story. When she was 24 years old, Nellie and her sister moved to Cedar City, along with friends from the handcart company. There Maggie married Jack Walker and Nellie became the first plural wife of William Unthank. His first wife, Mary Ann, had no children but encouraged him, as wives often did in that day, to marry again. He did so, actually taking two new wives, Ellen Pucell and Margaret Smith. They were sealed to him in the temple on the same day and in the same ceremony. Nellie eventually bore six children. She got along very well with Mary Ann, who accepted her kindly, took care of her when she was ill, and even helped raise her children. Though married Nellie was still in poverty, but she cheerfully made the most of her lot in life. Her first home was a one-room log house with one door, two windows, a dirt floor, and a fireplace. But she was determined to keep her home neat and spotless. She dampened and scraped the dirt floor until it was hard and smooth, then mopped it with a damp rag every day. Each Saturday she whitened the stone hearth in front of the fireplace and hung clean curtains at the windows and around the boxes that served as cupboards. There was a pleasant fragrance in her little log cabin, because of its sparkling cleanliness, said her long-time neighbors. Nellie had to provide much of her own living. Constantly in pain and shuffling around the house on her knees, she took in washing, knitted stockings, carded wool, and did crochet work. She was too proud to accept charity, so if friends or neighbors brought gifts she always repaid by doing something for them, such as darning or mending. Sometimes the bishop or the Relief Society would provide a little help. Nellie was grateful for this, but she also wanted to repay. Once a year, therefore, she and her children thoroughly cleaned the meeting house. Nellie would probably be chagrined to think that a “day of praise” would be held for her, and she certainly would not approve of it. I suspect, however, that she would love the monument, for it depicts so well the joy of living that was hers, despite her suffering. Note: Information for this column came from the following: William R. Palmer, “Ellen Pucell Unthank,” Instructor 19 (April 1944), 152-55; “Handcart Pioneer Memorialized,” LDS Church News, August 10, 1991; “Nellie Unthank: Despite Hardships ‘She Gave More Than She Received,’” LDS Church News, August 10, 1991; W. Paul Reeve, “A Nine-Year-Old Girl Triumphed over the Handcart Tragedy,” History Blazer, August 1995, as recorded online at http://historytogo.utah.gov/utah_chapters/pioneers_and_cowboys/agirltriumphedoverhandcarttragedy.html and a few miscellaneous online sources. Literature on the handcart companies is profuse, but to begin with you should look at Leroy R. Hafen and Ann W. Haven, Handcarts to Zion (Glendale, Calif.: Arthur H. Clark, 1960; Rebecca Cornwall and Leonard J. Arrington, Rescue of the 1856 Handcart Companies (Provo: Brigham Young University Press, 1981); Howard A. Christy, “Handcart Companies,” Encyclopedia of Mormonism, ed. Daniel H. Ludlow (New York: Macmillan, 1982), 2:571-73; Heidi Swinton and Lee Groberg, Sweetwater Rescue: The Willie and Martin Handcart Story (American Fort, Utah: Covenant, 2006). For further bibliography, go online to mormonhistory.byu.edu using advances search keywords handcart, handcarts, and Unthank.  The Story of "Come, Come, Ye Saints."